Sometimes Windows 7 OS may not read your correct user profile properly, instead, load with temporary profile which will look completely different. If you are not aware of temp profile or missed to see the pop-up message at bottom right side of the screen, then really you will be surprised to see completely different and new desktop without your files,folders,shortcut icons and any customized settings.This guide shows how to fix temporary profile issue on Windows 7. “You have been logged on with Temporary profile”- that’s the famous message from Windows 7. Even though this article was published back in 2010, I’m rewriting this again on August 2012 with more information, inputs, related links and the experience I had on this issue for last two years in domain and workgroup environment. Why Windows 7 Loads with Temporary Profile? Obviously, your profile (the files and folders located under C:\Users\user_name) is corrupted. There is another chance which is a delay in reading your profile files due to Antivirus scan or something else during boot up. Usually after typing your user name and password Windows tries to read and load your profile, if it gets corrupted or delay in reading, Windows will load with temp profile to give temporary access on computer. 3) Few times this method worked for me, repair the corrupted files. Usually the corrupted‘Ntuser’ files cause this issue. So, run the check disk for partition which is having user profile. 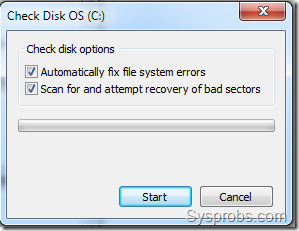 Windows 7 check diskAfter restarting for check disk, if you see corrupted entries and repairing process inside your user profile folder, then you can hope for good news here. If it finds and repairs any files especially Ntuser files, you may get your old Windows 7 profile back. But Microsoft suggests to copy entire old user profile (except 3 files) as shown in this official site link. Go to Advanced settings of System as shown below, click on Settings (user profiles), select the corrupted user profile which is not loading properly in Windows 7, then press Deletebutton. Delete button will be enabled only if you login with different user account. This will remove the entire user profile and related user SID from computer including the registery keys we talked about earlier. You can cross check the proper removal of user account (SID) by checking the C:\Users folder. Once it is remove properly, restart the computer and login with same user name (which was not loading earlier). The computer should create a new user profile as this is the first time the user is logging on. You need to copy back your old important data to new profile and set email outlook etc..if required. I hope these tips help to fix temporary profile issue on Windows 7.